As the sun begins to set, the light dims and makes the gradual decline into darkness. Eyes adjusting to a diffused, softer focus of light, a sense of ambiguity prevails. A strange, almost eerie presence hangs silently in the air during this short period of time between sunset and nightfall. This distant yet familiar scenario plays out in the space of Project 88 as you enter into the dusky world of Pakistani artist, Huma Mulji where her solo exhibition entitled ‘Twilight’ is currently showing. Stepping inside from the sunny humid Mumbai daylight, a change of atmosphere into the dimly lit gallery space is immediately present. Aptly titled, Mulji’s works presented in ‘Twilight’ depict a world, suspended in a state between day and night, a strange world seemly balancing on the cusp of reality. This state between two things is continuously played out throughout Mulji’s work, which places itself somewhere between sculpture and painting, photography and installation. The world Mulji presents is a strange everyday reflecting upon her own depiction of life in urban society. The works explore this feeling of urban living and ware down of environment, focusing both on the realities and absurdities within. 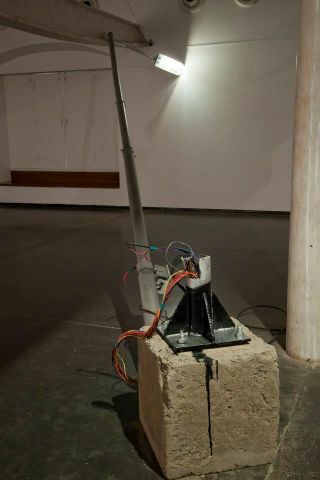 A sense of decay is evident in several of the pieces, difficult not to immediately focus upon is Mulji’s ‘Ode to the lamppost that got accidentally removed in the enthusiastic widening of Canal Bank road’, a life sized sculpture of a broken down lamppost which sits defeated centrally in the room, every so often giving flickers of life through sparks of dim fluorescent light. Near by mixed media wall pieces ‘Hotel Jabees Room 404’, ‘Ode to window AC’ and ‘Ode to a tubelight’ too create a sense of forgotten and decaying space. These reliefs give a window into a different space, ridden with both memory and anxiety. In particular ‘Hotel Jabees Room 404’ creates this feeling, a section of a well-worn carpet, in one corner a dead cockroach sits. Brightly coloured the carpet creates the atmosphere of a once lively place now riddled with a past, the viewer cannot help but imagine the context of the space. The sense of presence, loss and memory of place is continued throughout the exhibition. 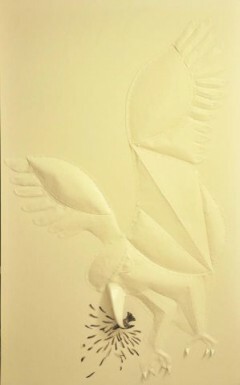 Reality and fiction associated with place is too played with in ‘Sparrow’, where an enamel figure of a giant bird carrying a smaller bird in its mouth is placed as a part sculptural relief on a 2D board. A splutter of feathers, as the viewer gets closer to the small bird, there is the initial discovery that it is in fact a real taxidermy sparrow now prey to the large fictionalised bird. This frozen scene within the piece encapsulates a moment caught between life and death, and the presence of a real bird brings an overwhelming sense of reality to the scene. 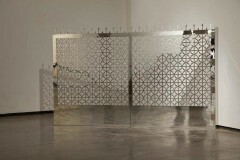 ‘Untitled’, a sculpture consisting of a laser cut acrylic gate stands in one corner of the space. Opposed to the lamppost sculpture, this gate is not a real functioning object and instead a fabrication of something real. The shiny acrylic material of the piece and clean-cut edges juxtaposes with the rough and real aspects of other pieces, where we see materials such as concrete, electrical wires, old carpet. It glistens in a dreamlike way, reflecting remnants and ideals of the American white picket fence, referencing the faded American dream. Perhaps the pieces too explores a feeling of a similar Pakistani dream, a sense of a lost dystopia, a sparkling isolated gate standing alone amongst a declining environment. The fence motif is replicated within the exhibition in a series of photographs, where images of abandoned communal spaces are subtly overlaid with the grid like shape. Although again beautiful glistening lace like shapes, the grids here remind us of physical barriers, the act of keeping one in or out of a space, and we are reminded of the conflicts living in urban society. ‘Twilight’, is a world also void of real time human presence, there are traces of life which seem to haunt the space, when the viewer enters the gallery the world seems to become alive, although trapped within its own suspension, the viewer becomes like a member of this lost society exploring facets of urban life within. Mulji’s world is caught in this suspended state between day and night, reality and fiction, decay and sparkle, life and death, humour and gloom, the viewer is given a glimpse into a world which is in continual transition between evolving states, reflecting life in a modern day post-colonial country. I leave the space in the knowledge it will continue in this suspended state until the next viewer enters, and stumble back out into the busy, noisy, sweltering and continuously moving streets of Mumbai.